Where the particulates are (and aren’t) | Wott's Up With That? “Where the particulates are (and aren’t)“. NASA posts a press release (New Map Offers a Global View of Health-Sapping Air Pollution) about an estimate of the global distribution of fine particulate matter, and talks about efforts to assess the health risks these particles pose. Anthony Watts decides it’s all just dust (natural!). 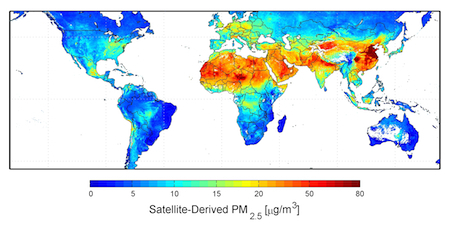 Satellite-derived map of particulate matter (<2.5μm) distribution averaged over 2001-2006. Source: Dalhousie University. Donkelaar and Randall Martin published Global Estimates of Ambient Fine Particulate Matter Concentrations from Satellite-Based Aerosol Optical Depth: Development and Application in Environmental Health Perspectives. They combined data from the Multi-angle Imaging SpectroRadiometer (MISR) on NASA’s Terra satellite and the Moderate Resolution Imaging Spectroradiometer (MODIS) instrument on both NASA’s Aqua and Terra satellites. This entry was posted in It's Natural, Random and tagged Dust, NASA, Press Release, Satellites by Ben. Bookmark the permalink.